You know, I am really getting to the point where I don’t care if what I have to say about school sounds smart, or even if it is particularly compelling or convincing. I only care that I know that what I say is true: the truest, truest true that it can be. Because if we are going to be in the business of Making Other People – of consciously, deliberately climbing into their lives, daily, with the express intent of changing who they are into something new – well, we had better be damn sure we think we know what we are doing, and be able to explain it. And it better make sense. Our reasons for doing what we do had better be the most excellent ones we can come up with, and they best be aimed at the absolutely most important outcomes we can aspire to. Tonight was closing night of “Oklahoma!”, Watauga High School’s spring musical. It was astounding: the leads all still had voices, the extras were all still in character, the jokes still landed and, incredibly, not a light or sound cue was dropped, that I could tell. I was a wreck through their opening night, sympathetically, because for a few years I directed the plays at The Field School, back when I was a full-time high school teacher, and still remember what it takes to bring together a big production like that. How many moving parts, most of which don’t become visible until you run the whole thing for the first time a week before you open and all the seams you didn’t know had to be there show themselves, unraveling. Every spring at Field brought Studio Day in late April. Field believed that every student needed to develop “all three legs of the stool”, as our founder described it: academic, athletic, aesthetic. Which meant that every student, every year, carried a full course load, but also played a sport and participated in a studio or performing arts experience. So for the arts faculty – some of the finest artists and educators I have ever known – spring always meant bringing everybody’s work to its ending point, the point where it was ready to show. Everybody crashed boards in the last weeks: students were coming in early and staying late in the dark rooms, at the potters’ wheels, in the paint studio to finish their stuff. I helped found the jazz band my first year there, which always performed – and, as I mentioned, the musical would play at least once on Studio Day too, as I remember. So the amount of stuff to bring in on deadline was immense. But the day itself was overwhelmingly beautiful – beauty to stop you dead where you stood, wherever you looked. Every inch of every wall of the place showed something gorgeous: paint, photo, poetry, clay. We mingled and drank punch and listened to the jazz band outside on the astroturf and wondered at how these kids could be so much, do so much – give us so much more to see. How their work is good. I learned to talk about these three essential outcomes mostly from wonderful Elliot Eisner at Stanford, and could (should) footnote it as such, but have probably changed it up a little through my own experience. As it turns out, the arts are among the best realms in which to help students learn these three things, but they can be learned just about anywhere else as well. And, I regret to report, that students learning these three things in school nowadays is far more the exception than the rule – and where it’s happening, there works a teacher worth her weight in gold. What are we to do next? To teach is to assert that this thing that I am about to draw your focus to is worth doing. On its own merits, and because of what else it will allow you to do; because of how knowing it has enriched my own life, and because as you learn it it will enrich yours too; because it will prepare you to better engage the experience that awaits you, to make sense of it, survive it, and thrive in it. This is the core assertion of making curriculum and embarking upon it with students: This Is Worth Doing Now. The teacher rarely teaches this kind of discernment explicitly, but it is all over her practice. Amazing Ms. Miller, at Watauga, did it the moment she announced that the show that year was to be “Oklahoma!” She knew she had the four male and two female leads she’d need to pull it off; she knew she could open up the group numbers to include the hundred who would come out wanting to be part of it; she knew the show’s payoffs and anticipated how they would play to this town, in this county. As they worked the show up, she and her colleagues helped the students learn what to attend to first, and how: the lines, the songs, the character development. Eisner notes that only in the arts do we develop the discernment to see how our last brushstroke on the canvas changed the overall work, and to let that discernment inform what we do next, all in the “absence of rule,” as he says (real painting is not paint by numbers). In putting on a show, students need to have the opportunity to feel the way their confidence grows by a master teacher supporting them in developing first just this skill, which leads to the capacity to do further things. The whole experience of putting up a show – drama, musical, marching band, orchestra, ballet, improv comedy – is a process of engaging right-sized tasks, in the right order. Expert teachers facilitate the process so that students suddenly find themselves competent to do what the show asks of them; they accomplish this by asking them to stretch enough to feel it, enough to grow, but not so much as to break. Before we dismiss the extraordinary skill set a teacher must possess to pull this off, we can probably all remember a time in school when our teacher didn’t have it. When the expectations put upon us were unrealistic, or the project we were asked to work on was unworthy of our time and energy, or when the composite elements we needed to master weren’t adequately explained or staged out. The negative experience highlights the wonder of the positive one, doesn’t it? When is our work done? This question seems a little nuts: the work is done when the show opens, right? Last Thursday night, for the Watauga cast. When Studio Day arrives. “It might not be done, but it is due!” Certainly working within external constraints of time and resources is a huge part of putting it together. The teacher must choose tasks that are doable with what is available to offer. But it’s only part of what this principle means for teaching. Teachers must help students come to understand when their own work is done: when they have done all they can on a project, learned an aspect to the best of their ability. Sometimes it means pushing a student beyond what he considers good enough. (I’ll be forever grateful for the chorus teacher who cast me in a lead singing role in the middle school musical because she heard I had a voice, then hollered at me in practice to “sing already!” until I got enough air behind it to believe her.) Sometimes it means unwinding a perfectionist student so she can get out of her own way, silence the critic that tied her in knots before you met her and is still yammering away inside her head. In either case, it’s about giving the student control over the work. Eisner notes that a painter must be able to judge when the work has achieved a desired effect (or an unanticipated effect that is more desirable than the one she set out to accomplish – another unique aspect of the arts is that goals can change is response to emerging opportunities). No one tells the painter, or the artist, when a work is done, ready to show or share. It’s a capacity that we must develop ourselves – and we learn how to by watching and hearing those more experienced do just that, for ourselves and for others. Ms. Miller had to help her actors come to understand when their work was as complete as it could be – which is not the same thing as giving yet another round of nitpicking notes about what could be better. Ceaselessly revealing faults doesn’t build capacity to create; it warps it, turns expression into a cautious composite creature that just wants to avoid being criticized ever again. When is our work good? Is the painting good because it is praised by the famous critic? Is the play good because all the people who are not our parents laughed at its jokes and stood and applauded at the end? Well, yes – to begin with. A sublime moment happens in education when work stops being a school thing and starts being a thing thing: an endeavor that has value outside the artificial world of assignments and grades, expectations and assessments and feedback loops that make us accountable to do better next time. Tonight’s play was not a school thing. It was enabled by school, supported by school – it even happened IN a school – but it was MORE than school. People came who did not have a kid in the cast. People came because they wanted to be moved by a true soprano singing beloved songs that were meaningful to some in the audience before the singer was born. People came to “Oklahoma!” because they wanted to root for Curly to get his girl in the end and survive Jud’s thuggery; even if they had seen the show a dozen times, they wanted to go on that trip with someone else. And in the first moments of “Oh! What a Beautiful Morning!” the crowd realized tonight’s Curly was rock solid, and they could stop worrying about him and believe him, make his struggles their own. I felt the room relax as they realized this was a real show, not a school show. They could laugh when something was funny and applaud when something was beautiful – not because they’d be embarrassed for the kids up there if they didn’t. Kids smell phony. They know pity applause, and despise it. More to the point, they smell a phony teacher – they know when they are being turned out to make a teacher look good, to burnish a resume, and they hate it. That kind of teaching teaches cynicism and manipulation; it feeds off of fear and encourages abuse. Kids need teachers who are manifestly at peace with themselves, who live in joy, and whose joy is, in some way, linked to their choice to spend their lives negotiating connections between an endeavor they love and a constantly-rotating group of young people who are there to learn to love it too. Kids need this deepest, most intimate lesson from their teachers, even if they never ask for it and teachers never plan to give it. They give it because it is the deepest and most vital lesson we ever teach: that “this is a way to be a happy adult.” We note that children see more of their teachers than their parents once they get to high school, but fail to remark on the real implications of this institutionalized fact. What are these adults showing them about adulthood? Are they dependent upon external validation to give their lives worth – their students’ grades, or their students’ approval? Or are they sourced in something deeper – something that is related to what they choose to teach, and how they choose to teach it? And THAT they choose to teach it? Are they whole adults who dedicate their lives to helping others find their own, and don’t count the cost – not because they are martyrs, but because extravagant giving and receiving is in fact the real economy of love, one that results in there always being plenty to go around? I am going to stop before enumerating the ways in which the path our public education system is currently on fails to make the truths I have affirmed here a priority. Even a casual student of contemporary american education reform can list some of the ways that teachers are, in fact, having the definition of their work constrained even as it needs to be growing; having their autonomy removed even as it needs to be enlarged. Can see how challenging, even impossible, it is for a contemporary public school teacher to find and strengthen her relation to her content, and to herself, that such a teaching requires, when so much of her energy is consumed by administrative overload and quantification of that which cannot be quantified. When the value of her work is increasingly reduced to a value-added test score that is taken to indicate whether or not she has exceeded, met, or failed to meet expectations. As I have heard said, you can’t fatten a pig by building a more expensive scale. Never could. Rather, I want to thank and honor the teachers who pull off such remarkable moments: peak experiences where the students and those fortunate enough to witness them know that their work has transcended school, even as it makes school so much better than it “has to be.” I am so grateful I’ve been able to teach with such extraordinary colleagues, and been part of the journey of so many wonderful students so far. It’s such an honor and a privilege to have more to do. 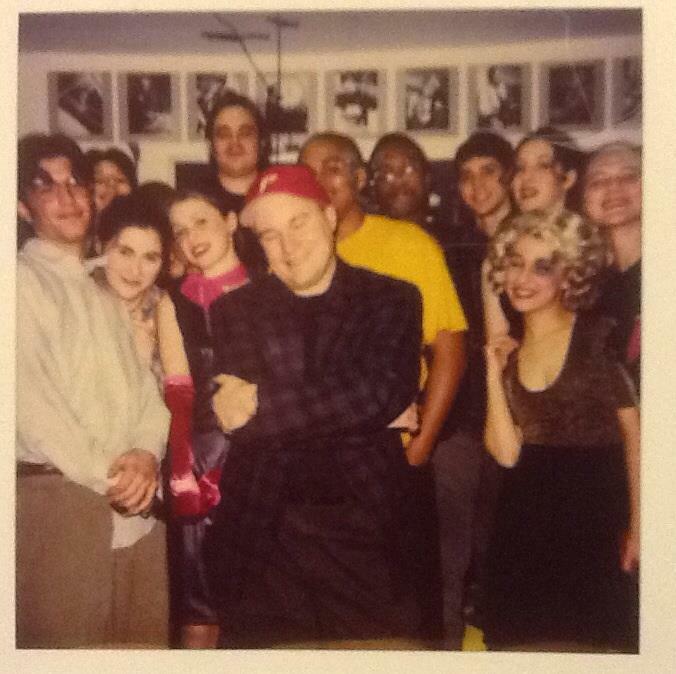 Image taken backstage in 1997, closing night of The Field School’s production of Little Shop of Horrors. Shing-a-ling, what a creepy thing to be happening! I love you guys. « Why Teach the Humanities in Education?